James from Mr Rumsey’s Film Related Musings has kindly contributed this article for Silent Film Week which takes a look at Martin Scorcese’s Hugo and the relationship it has with the films of Georges Melies. It is an absolutely cracking article and I hope you enjoy reading it as much as I did. 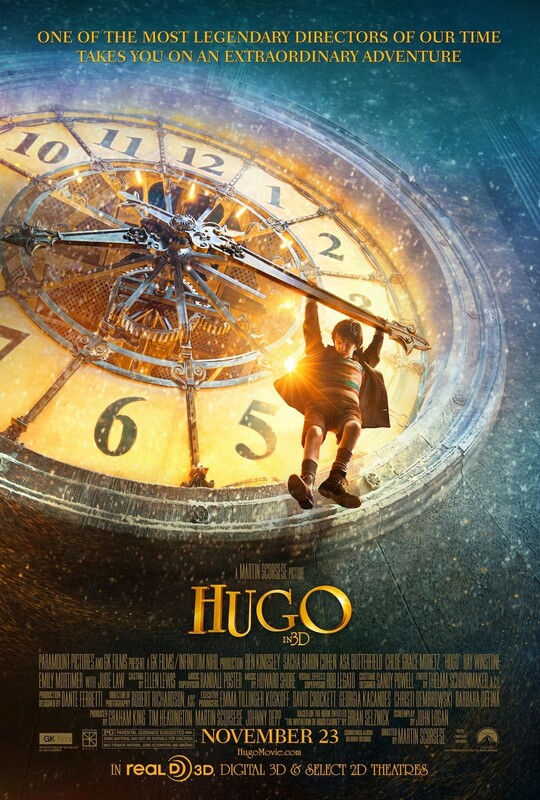 Perhaps almost incorrectly labelled as a kid’s film, Hugo (2011) is as much a love letter to the medium of film as it is a family adventure movie. This is Scorsese reminding us why we all love films as much as we do, and he’s looking back with a particularly fond eye to Georges Méliès and to the inventive short films that he made between 1896 and 1913. Set in Paris during the 1930’s, we follow the story of a young boy named Hugo Cabret (Asa Butterfield), an orphan who lives within a train station’s walls and who spends his time tinkering with machinery and clocks the way that his father taught him to. His father’s love for the movies transferred over to Hugo, and that love is taken up by the film and held proudly for all to see. It’s no secret that this is a celebration of the medium, as Hugo’s adventure leads him through what’s almost a history lesson in early film making, famous events such as the Lumière brothers’ screening of L’Arrivée d’un train en gare de La Ciotat (1896) are depicted, but the films’ real focus is on the highly imaginative works of George Méliès. When trying to pick an example from Méliès’ work to discuss here I was faced with a near impossible decision, I could honestly have picked any of them, and if you are not familiar with his work then I strongly suggest that you head on over to YouTube and check some of them out. It would be well worth your time. Anyway, the film that I picked out for this post was his Cinderella (1899). Here you can see numerous techniques at work which he has now became famous for, such as the stop trick where the film is stopped, the actor/actress moved, and then the film starts again in order to create the illusion that the person has vanished, or in some of the cases here, an object is transformed. Aside from the visual trickery, this film starts off pretty much as we would expect it to. It’s the recognisable fairy tale which we are all familiar with, and everything seems relatively normal. But then we are suddenly surprised by the wonderful method that he chooses to use in order to depict time. It’s not only very effective and startling, but also, for me at least, it’s really rather fun. It’s when looking back on Méliès’ films that I came to wish that Hugo could have been more inventive, had played with its form and our expectations to a greater extent. It would certainly be suiting considering the legacy that it is celebrating. It’s for these reasons that I believe that the film absolutely deserved to be shot on digital and in 3D. It is in actual fact the perfect treatment for such a film. It celebrates film, and the childlike pleasure that we get from seeing films, and whilst it looks back with a very fond and grateful eye on the past, particularly Méliès, it also absolutely celebrates innovation and the desire to try new things. Is Hugo as imaginative as Méliès? Not by a long way, but then that’s hardly surprising. Yes, I would have liked it to have stretched itself a little more, and yet it still delivers a satisfying story which is backed up by a great cast including Asa Butterfield, Chloë Grace Moretz, Sacha Baron Cohen, Emily Mortimer, Helen McCrory, and features a particularly strong performance by Ben Kingsley. It’s a heart-warming film that delivers adventure and a childish delight in the exciting world of storytelling, whilst also somehow being a film history lesson and a celebration of movies both old and new. I want to leave you with another one of Méliès’ films, this one is particularly vivid, and I think frankly is nothing short of spectacular. The richness and vibrance of the hand painted frames is something to behold. Please spend a few minutes with The Merry Frolics of Satan (1906) and see what you think of it! Want to win a copy of The General thanks to Madman Entertainment? Check out all the details here. James is the creator and writer of Mr Rumsey’s Film Related Musings. Be sure to check out his site for a continuous stream of really fantastic reviews of a wide variety of movies, both old and new. Head on over to the great site Not Now I’m Drinking a Beer and Watching a Movie and read my guest post. Then be sure to read through the rest of Silent Film Week as well! Thanks again for writing it man. I really love the article. Nice review. This was one of my favorites of 2011 and I was impressed how Scorsese handled 3-D. Thanks! I didn’t see this one until I rented it in order to write this review, but I’m very glad that I did! It was great to see Hugo highlight the work of Melies. Immediately after I saw it in theaters, I went home started looking up Melies’ movies on YouTube. I think that’s a testament to the magic of Scorsese’s tribute. Really great write up. I’ve got Hugo sat at home to watch but haven’t got round to it yet. Cheers man, I imagine that you’ll like it!